In the last couple of decades, there is a general agreement in the literature that brands can be anthropomorphised. Researchers use human analogy to analyse brands and suggest that brands are entities that consumers perceive that they have certain gender (i.e. Azar 2013, 2015) and idiosyncratic personalities (i.e. Aaker 1997). 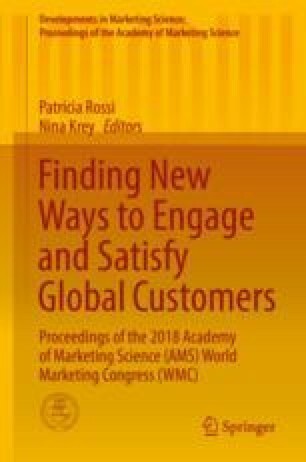 This stream of research goes further and argues that consumers form human-like relationships with brands (Fournier 1998; Veloutsou 2007; Alba and Lutz 2013; Veloutsou 2015; Alvarez and Fournier 2016). The existing research examines very few other aspects of the nature and the components of the consumer-brand relationship except its valence, from brand love (Carroll and Ahuvia 2006; Hwang and Kandampully 2012; Wallace et al. 2014; Karjaluoto et al. 2016) or brand passion (Albert et al. 2013) to brand dislike (Demirbag-Kaplan et al. 2015; Dalli et al. 2006) and brand hate (Bryson et al. 2013; Zarantonello et al. 2016; Hegner et al. 2017). However, when the human relationships are examined, researchers appreciate that there are other components of the relationship that are of importance for a healthy, long-lasting and flourishing relationship. Respect is appreciated as one of the most important benefits in social exchange (Arnet et al. 2003) and in close relationships (Markman et al. 1994), plays a powerful role in human life and is key for quality human interaction (Dillon 1997). There is a clear need to operationalise respect in a manner that the measure can be easily adapted and used in other market situations. The development of such a scale is the second objectives of this paper. Therefore, this work reports the findings of three studies that aim to better understand and operationalise respect. The first study draws from literature from various disciplines and aims to define respect. In study two items were generated. Both the definition of respect and the items were sent to 15 marketing academics to secure content validity. Two samples in the UK were collected to generate data for this third study. The first sample consisted of 194 respondents who were asked to answer the questionnaire having in mind a celebrity that they are familiar with. The second sample consisted of 217 respondents who were asked to answer questions on the degree that they feel that their selected brand of cars respects them. The seven of the nine items had high correlations with the direct respect measure (over 0.53 for respect to the brand and over 0.54 for respect from the brand) with one more with high correlation for the respect to the brand. All items were loaded to the same factor in factor analysis with an eigenvalue of respect to the brand and the same seven as in the previous analysis to the same factor with loadings over 5.31 for respect from the brand and Cronbach’s alpha of 0.94 for respect to the brand and 0.92 for respect from the brand. In the CFI the standard loadings were 0.71 for respect to the brand and over 0.68 for respect from the brand, while the CFI and GFI were 0.99 and 0.98 for respect to the brand and over 0.97 and 0.95 for respect from the brand, respectively. Therefore, it can be argued that these seven items capture respect. The author would like to thank David Philpott and Cem Genc for their help in the data collection for study 3.